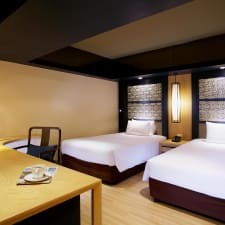 Prime Hotel Central Station Bangkok is located close to the MRT underground and Hua Lamphong railway station and is near Bangkok's Chinatown district. Accommodation choices are standard rooms or suites, with king or twin beds sleeping up to four people. All units have free Wi-Fi, air conditioning, and an in-room safe. The rooms also feature flat screen TV with international channels and tea and coffee facilities. The suites offer separated living areas. Some rooms have scenic city views. Prime Hotel Central Station Bangkok has a fitness centre with sauna and steam room. There is a car park onsite and laundry services are available.The hotel has a meeting space that can accommodate up to 365 people. Chyna, Station Cafe, and Chyna Terrace restaurants are all onsite and the hotel offers room service. Other nearby restaurants include 511 Cafe and T & K Seafood. The hotel is close to Temple of the Golden Buddha and Sampeng Market. The hotel is just across the street from public transportation, but also has a lot in the immediate are to recommend it. It's an easy walk to several temples and near the river. You can walk or ride anywhere you'd need to go. There are several features to to hotel that aren't featured on the website. There The spa services onsite are great for relaxation and the breakfasts served in the restaurants are filling and delicious. The views from the rooms are really stunning and there is a lap pool located on the rooftop with bar service. The rooms are spacious and the suites give plenty of space for family use. There are TVs in both the bedroom and living area and there is daily cleaning service offered. Not all the staff speak English, which could inhibit some customer service aspects. Wi-Fi isn't available in all the rooms and you might be wandering around looking for a hotspot to connect. Also, be careful when booking and ask for a room with a view. Otherwise, you'll have a dark room with no window. The rates charged here are quite expensive. Other expensive charges will include the higher prices at the onsite restaurant and the exorbitant rates for the laundry service. Construction in front of the hotel can be off-putting for guests staying here for the first time. That confusion only grows when you discover that reception is located on the 12th floor of the building and your room is located on other floors. In all, staying here requires a good sense of direction.